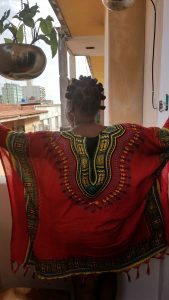 In my recent trip to Cuba, I experienced an unusual feeling of being in a “safe space” as a Black woman that I have only felt in one other Latin American city- Cartagena (http://haiti-progres.com/news/2018/03/14/blackness-in-cartagena-colombia-a-jamericans-experience/). This sense of belonging began upon entering the airplane when the flight attendant queried if I were Jamaican because of the red, black, green and gold earring I was wearing. 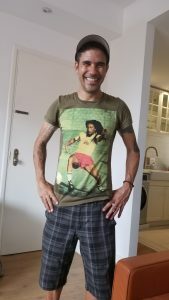 It continued in meeting our cab driver who was of darker hue, arranged by our host Yanier who showed up wearing a Bob Marley tee shirt. The streets of Havana are decorated with a population that resembles the entire Black and White race/color spectrum, the evidence of an integration of tres raices- Tainos, Africans and Spaniards. There was an ease in the interactions of the phenotypical colors of the rainbow, as it should be, but, often is not evident in most countries. My hubby and I discussed this observation and we concluded that perhaps, the attempts at creating an egalitarian society has interrupted racial discord, as race and class historically intersect in providing the dialectic of the understanding of social inequality. Albeit, we are not that utopic to presume that issues with race or color are absent from this country, or that all the white, wealthy Cubans are in Miami LOL. However, there was not one incident where we felt that our race or skin tone was significant in determining how we were being treated; in fact, there was more curiosity as to whether we were Americans. 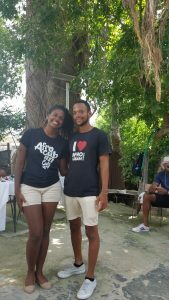 enlightenment and empowerment as we engaged in the Afro Cuban Tour with Arianna and Jose. We met in a quaint coffee shop that served Café cubano that mimicked the shades of the tres-raices. I am unsure if this coffee arrangement is deliberate as a racial commentary or just artistry, but, coupled with being in a group of primarily curious Afro tourists, the brilliance and beauty of Arianna and Jose, the tour started out with breathless excitement. Arianna with the eloquence of the Professor that she is, explained that the Afro history experience will be enveloped in an exploration of religion in her home town. We visited Guanabacoa, situated about three miles to the southeast of La Havana. This exploration of Afro Cuban history through religion, cemented the already known fact that the Africans outside of Africa, captured and enslaved in the Americas had to be creative to survive and as such, religion became a source of resistance and survival. Being Jamaican, I have heard all my life about obeah, and I have heard and seen the pocomania and Jonkanoo displays and have always been curious. Despite having researched these cultural expressions and practices theoretically in Africana studies, I never had the courage to experience them in person. The brainwashing of the slave owners that African traditional religions were acts of witchcraft, like other efforts of psychological enslavement are long lasting and has resulted in most Jamaicans/ Africans out of Africa being wary, frightened and timid about any engagements of such African traditions, despite subconscious lingering evidences in our daily cultural habits. 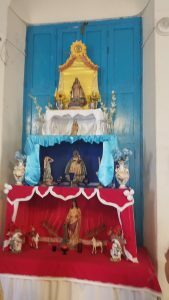 In Cuba, according to three different tour guides, between 60 and 80 percent of Cubans practice Santeria- the synchronism of African Traditional Religions and Christianity (Catholicism). Santeria is similar to Obeah (Jamaica), and voodoo (Haiti and New Orleans) and explains the cultural diffusion of religious practices of Yoruba with Christianity. This synchronism of African religions with Christianity emerged as a response to the imposition of a foreign religion-Christianity by slave masters and grew out of the need of the enslaved to survive. Enslaved Africans were beaten and killed if they resisted conversion to Christianity. Consequently, the blending of Yoruba religions (which included selecting “saints” to represent African gods) provided a disguise for the continuation of the African’s own belief systems. Pretty dope, if you ask me. We visited a museum displaying artifacts of the synchronism of religions and then a Babalawo’s (Priest) house where we were taught the purpose and method of spiritual cleansing. 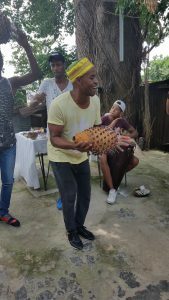 We concluded the tour with engaging in a ritual of African drumming and dancing and enjoying a sumptuous Criolla comida (creole food). Throughout the tour and after, there were passionate conversations about the power of maintaining our identity despite barbaric efforts to strip us. We observed the pride and resistance in the Cuban people, then during slavery to give up their religion and sense of self, and, then again since 1800s to give up to the hands of imperialism. We left feeling stronger in our Africanness as we witnessed the power of our ancestors resistance and our Cuban hermanos commitment not to be conquered. They joked that Fidel was protected by Santeria, hence why no one was successful in killing him and I wonder….